The crazies over at the American Family Association regularly send me their hysterically funny newsletters, always full of money-begging and fear-mongering. More often than not the back page will be an ad for some family value voters summit, plastered with photos of Rush Limbaugh, Ann Coulter, Sean Hannity, etc. I sometimes forget this is coming from a religious organization and not the RNC. 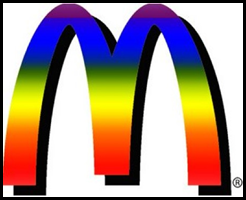 Last year AFA wanted me to boycott McDonald’s because the company refused to end it’s association with the National Gay and Lesbian Chamber of Commerce. They sent me a cute little prewritten sticky note that I was to take to my local McDonald’s and stick on the money used to pay for my last McDonald’s meal. The note would inform the Manager that until McDonald’s stopped siding with moral corruption and became neutral in the “culture war” I simply could not in good conscience spend my hard-earned Christian dollars at the restaurant. Hilarious, right? Hilarious, odd, and scary, all swirled into one nightmarish little Neapolitan mix. Needless to say, I never dropped off the note at McDonald’s. 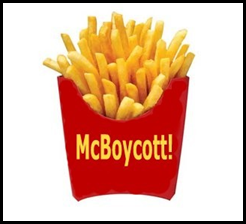 And the boycott was a total and complete bust, as McDonald’s stock went up nearly every single day that the boycott was active. Lots of gays drinking lots of iced coffees, yes, yes we did. Those few comments are just from the selection made in the last hour, truly terrifying. Now for the GAP win aspect of this post. It was just announced today that the profits of Gap Inc. were up 25% in the last quarter. The timing of AFA’s silly boycott could not have been better. Now my fair-minded, non-crazy friends, I encourage you to pick up a few extra GAP gift cards this year for your friends and family. I know these AFA folk probably don’t normally shop at GAP anyway, but I think that regardless it couldn’t hurt for us to support GAP’s spirit of inclusiveness. Family, friends…yes, you’re getting GAP gift cards. HAPPY HOLIDAYS!